Boundary layer sources for the Asian anticyclone: Regional contributions to a vertical conduit. Bergman, J.W., F. Fierli, E.J. Jensen, S. Honomichl, L. L. Pan. 2013. Boundary layer sources for the Asian anticyclone: Regional contributions to a vertical conduit. 118 (6): 2560-2575. Airborne observations and modeling of springtime stratosphere-to-troposphere transport over California. Yates, E.L., L. T. Iraci, M. C. Roby, R. B. Pierce, M. S. Johnson, P. J. Reddy, J. M. Tadić, M. Loewenstein, and W. Gore. 2013. Airborne observations and modeling of springtime stratosphere-to-troposphere transport over California. Atmos. Chem. Phys. Discuss., 13, 10157-10192. Under discussion. Information content of aerosol retrievals in the sunglint region. Ottaviani, M., K. Knobelspiesse, B. Cairns, and M. Mishchenko, 2013 Information content of aerosol retrievals in the sunglint region. Geophys. Res. Lett., 40, 631-634, doi:10.1002/grl.50148. Uncertainty and interpretation of aerosol remote sensing due to vertical inhomogeneity. Zhai, P.-W., Y. Hu, C.A. Hostetler, B. Cairns, R.A. Ferrare, K.D. Knobelspiesse, D.B. Josset, C.R. Trepte, P.L. Lucker, and J. Chowdhary, 2013. Uncertainty and interpretation of aerosol remote sensing due to vertical inhomogeneity. J. Quant. Spectrosc. Radiat. Transfer, 114: 91-100, doi:10.1016/j.jqsrt.2012.08.006. For a complete list of recent publications, see 2012 Publications and (to date) 2013 Publications. IceBridge, a six-year NASA mission, is the largest airborne survey of Earth's polar ice ever flown. In 2007, a Space Act Agreement between NASA Ames Research Center and H211, LLC began a relationship that ultimately led to the formation of the Alpha Jet Atmospheric eXperiment (AJAX) Project. The Hurricane and Severe Storm Sentinel (HS3) is a five-year mission to investigate the processes that underlie hurricane formation and intensity change in the Atlantic Ocean basin. The objective of the NASA Earth Exchange (NEX) is to bring scientists together with the tools, massive global datasets, and supercomputers necessary to accelerate research in Earth systems science and global change. NASA Ames is developing advanced computer technologies for converting massive streams of satellite remote sensing data into ecocasts that are easy to read and use. 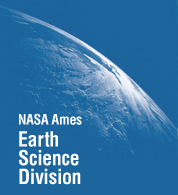 Access geographic data from NASA Ames Research Center, Ecosystem Science and Technology Branch for carbon sequestration predictions throughout the United States. 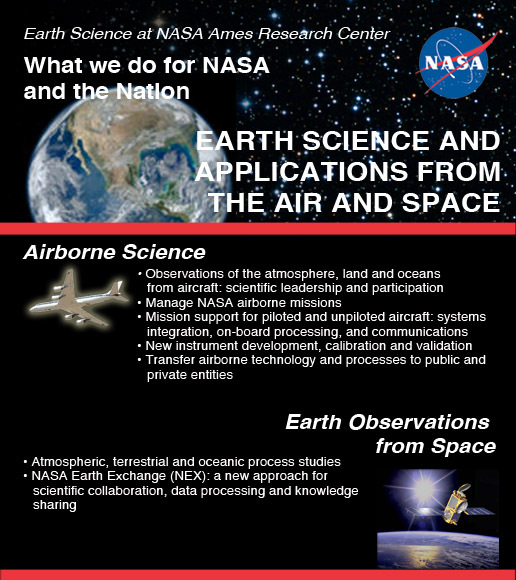 NASA's Coastal and Ocean Airborne Science Testbed (COAST) project was a NASA Earth Science mission to test airborne payloads optimized for remote sensing in coastal and ocean areas. COAST from Brett Casadonte on Vimeo. NeX 2012 Short Course for Earth System Modeling and Supercomputing by Brett Casadonte.